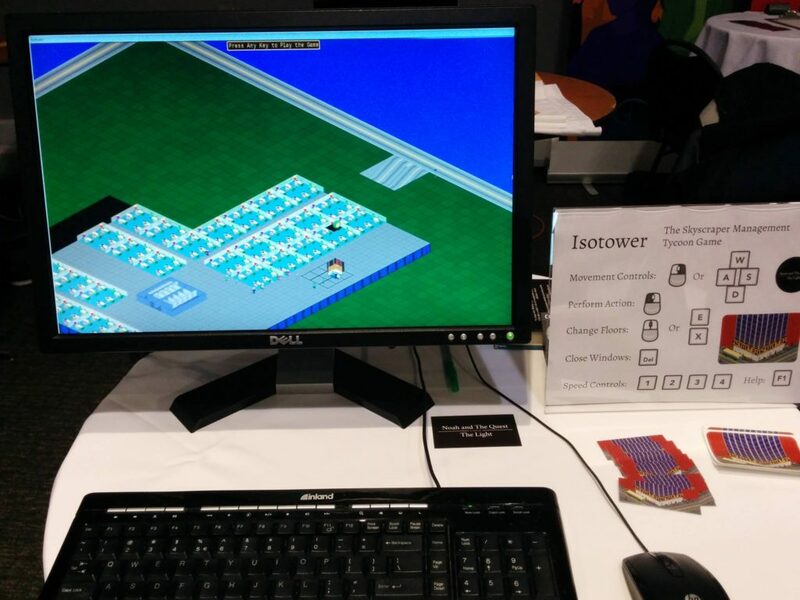 This past weekend, I exhibited Isotower at GDEX, a small convention for game developers in Columbus, Ohio. The organizers hoped for 5,000 attendees, and there were approximately 100 exhibitors there, spread out between 3 rooms. I opted for a small ISE table, meant for “Independent, Student, and Experimental” games. The convention ran Saturday and Sunday, with Friday being the day where all the exhibitors needed to show up and set up their booths. Back in August, I found/read through this article about automating a game to make sure it can exhibit well. I borrowed a lot of the basic ideas mentioned in the article, namely, creating an “attract mode” to the game that would draw people in to play it, or at least learn a bit more about the game. I ended up hardcoding a pre-built tower into the game on Thursday night before set up day. In addition, the camera would pan around the tower, and each time it completed a cycle, it would go up or down a floor, so every 15 or so seconds, it would display a new floor of the pre-built tower. All of the floors had something on them, except for one of the basement floors. So there was a short period of time where the attract mode wasn’t too exciting, but it didn’t last long compared to the more “exciting” floors. I spent a while getting a computer that could run the game well enough to demo. I had a few old computers, but one couldn’t run the shaders I had written, and the other worked, but had 1GB of RAM available total, which was shared between the OS and the on board video. Fortunately, I was able to borrow a computer from my partner, which ran the game nearly perfect, except it didn’t like fullscreen mode. I created a few builds of the game Saturday morning, and ended up being able to use a borderless window that acted almost exactly like fullscreen mode. I also printed out mini-business cards and stickers from moo printing. They turned out really well, but I severely over-estimated how many I’d need. I bought about 250 of each, and ended up only handing out about 80 of each, or a bit less. This isn’t a huge problem, since I’ll have stuff to pass out if/when I do other conventions, but it is something to note. I’m not sure how many people showed up for the expo, so it’s hard to judge the ratio of material needed to attendees. The ISE tables were small, the picture was above was about the total size of them. They were fairly centrally located in the exhibition hall, though there wasn’t a ton of space to maneuver to get to any of the tables set up in the back. Fortunately, I got there early enough on Friday to set up in one of the front rows, and effectively got a premium spot. Additionally, there was a scavenger hunt put on by COGG, the Central Ohio Gamedev Group. They had cards with 12 companies that were exhibiting at the expo, and if people collected stickers from 10 of those companies, they would get a prize (a small pokemon figure, I think). I signed up for this fairly early on, and it was a huge benefit. Over half the people who encountered Isotower that weekend noticed it in part because of the scavenger hunt. It was a huge boost to my traffic. The actual act of demoing the game went incredibly well. One of the last minute additions was a quick button to reset the demo to attract mode, and that was invaluable. Each time that happened, the game would save the current map, and at the end of the each day, I had 32 saves, so 64 save games total. Unfortunately, loading those saved games does not currently work, but I’ll do a full analysis of the resulting saves in a week or two once it does. I had a range of people who tried out the game. A few kids, a few teens, and a fair number of adults of various ages. Reactions were overall positive. One of my goals was to be able to playtest the game for ideas on how to improve the user experience, so I tried to stay silent for many of the early demos and watch as people worked out what to do. Eventually, I gave them a brief tutorial and pointed people towards a few of the buttons that did the most stuff. Generally, people were able to figure out the basics, depending a bit on how much experience they had with games in general, and tycoon games specifically. I brought some food to eat (peanut butter crackers), and bottles of water to drink. This meant I could eat and drink something without having to leave my table for very long, other than to refill water. I also had more people show up while I was eating then while I wasn’t. A coincidence, but next time I shall eat constantly to get more people to stop by. One of the kids who stopped by was super polite, introducing himself, saying thank you, and everything. He was awesome. I had a few people go completely crazy with building stuff, just sort of clicking everywhere until they ran out of money, or otherwise trying to break the game, or just do something it wasn’t really designed for (one man found the “replace floor/wall” buttons and built a moat around the tower, until the game crashed). In a lot of cases, those people were a ton of fun to watch. A lot of people brought up Zoo Tycoon and Rollercoaster Tycoon, along with a few other early 2000s tycoon games. Almost everyone was worried when they built bathrooms with the “entrance” facing out towards the grass/outside of the tower. I’ll be updating the bathroom graphics to make it a bit more clear. I found a fair bit of bugs in the game, but it only crashed a few times, which mostly seemed to happen for anyone that got to day 2 in-game. That only happened for a few people, and they were all willing to forgive the game. Obviously, fixing that issue is a high priority. The whole experience was truly amazing, since prior to this I wasn’t sure how people would react to the game. Watching people playing Isotower and having fun is a huge boost, and now I am more serious then ever to finish the game and get it released. It took a few days to fully recover, but I’m trying to find another expo nearby so I can exhibit Isotower again.